This is my second tumbling block end grain cutting board. This project gave my new flat master sander a good workout, but made me appreciate the sander. Very nice. I Love the 3D!! 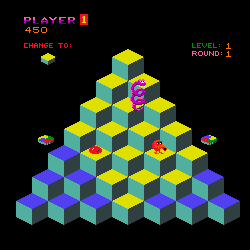 Me too, I can’t work on this pattern and not think about Qbert. I really like the look of this cutting board! I can tell this must have taken alot of time, accuracy, and patience. Great job. Looks like a great project. Do you have instructions? Wow! That thing really messes with the eyes. Very cool. I’m trying to imagine how it’s made, but I can’t figure it out. Jay, what a beautiful cutting board. The pattern is absolutely wonderful and it’s so nicely done. Oh, yeah!! That’s precision and WOW factor. Thanks for sharing. wow Jay, phenomenal work! Looks like perfect craftsmanship.